So Jon Snow is alive. Game of Thrones’ big surprise was one that a lot of East Coast viewers spoiled on social media, the one that was probably not much of a surprise to anyone who’s ever read a comic book or watched a soap opera. Of course the show saved it for the very last moment of the second episode of season six. 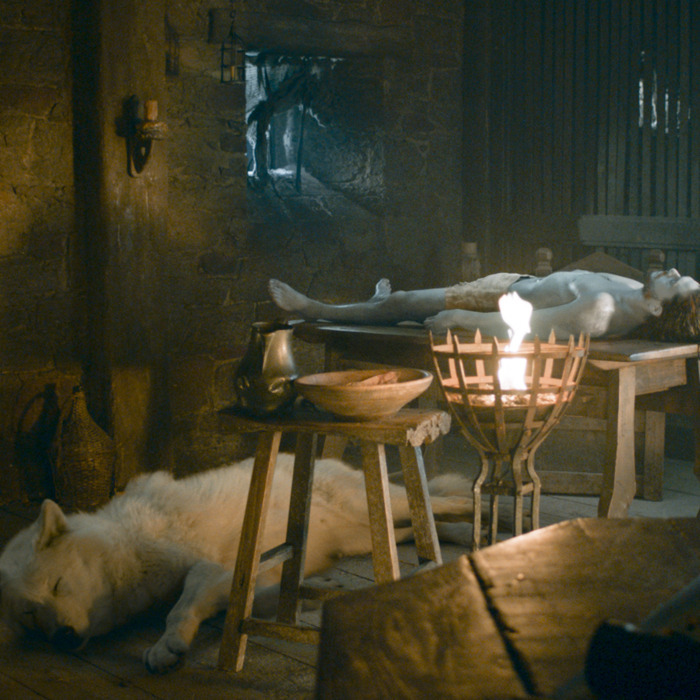 The perforated corpse of the beloved Jon Snow (Kit Harrington), the Night’s Watch commander betrayed at the end of season five, lay naked on a table while the priestess Melisandre (Carice van Houten) recited incantations and touched his freshly cleaned wounds. At first, the magic didn’t seem to work. One by one, everybody in the room left the table. And we got a long moment of silence. I mean long. Long. Longer than this damned paragraph. And then, bang: the eyes open. The lungs fill up. He’s alive! What happens after this is anybody’s guess. Maybe Jon Snow is not the Jon Snow we remember. Maybe he’s truly The One now. Maybe he’s evil. Maybe he’s a very articulate zombie. Maybe he thinks he’s Ethel Merman. Doesn’t matter — whatever follows his return can’t help but be more fascinating than the resurrection itself, which, in terms of buildup to delivery, is possibly the most disappointing “Surprise, he’s actually alive!” scene I’ve seen in the four-plus decades that I’ve been watching and reading fantasy stories. This was just lame. After all that buildup? And after Kit Harrington flat-out lied about the character’s fate to preserve the twist that people who’ve never seen a frame of the show could’ve seen coming? In the immortal words of William Shakespeare, give me a break. Don’t get me wrong. I accept resurrections as inevitable in this context, I like the character and the actor who plays him. I’m grateful for any hint of hope on this mostly dark, despairing series. It’s the scene itself I disliked. It was conceived and executed in the most pedestrian manner, underplaying to a fault, betting all of its dramatic chips on the mere fact of Snow’s resurrection carrying the brunt of the moment’s power. I wanted something more, or something else: an uncanny, eerie quality, or at least some visual panache. The tonal shift in season six, the first one not to be based directly on George R.R. Martin’s fiction, is fascinating, though. I don’t want to be too definitive on this point, since we’re only a couple of episodes in and there’s not enough narrative data to make a reliable sample, but it just feels somehow palpably different. For the first time I can recall, the writing is consistently superior to the direction and nearly equal in richness to the production values and the acting. I’m not referring to the dialogue, though there have been some gems (the bit about the five greatest pleasures in life was marvelously droll, verging on self-parody). I’m talking about the construction of scenes. Also the emotional beats within a scene, and how they’re set up and paid off. Think of Theon (Alfie Allen; I can’t call him by his other name anymore, it just feels wrong) embracing Sansa (Sophie Turner) in a snowy wood; Daenerys (Emilia Clarke) insisting on her regal privilege even after being stripped of it; the way Melisandre looks at herself in a blurry mirror before removing her necklace and revealing her true form. The show seems altogether more warm toward its women (even as it continues to menace them and sometimes kill them), and more inclined to shape all of its characters more in terms of who they are and what they believe rather than what they do or don’t do. Thrones has never been too big on giving its characters rich interior lives — it’s not that kind of show, for the most part — but they seem to be finding ways to do it without radically rethinking a series that most people like just fine, thanks. At the same time, the show also seems to be facing serious (potential) problems. One is how to set up the next great clash of clans/states in an organic, unforced way. Another is its apparent willingness to lean on Ramsay Bolton (Iwan Rheon) to satisfy the show’s mandatory quotient of Irredeemable Psycho Sadist moments, now that nearly all of the other cardboard baddies are dead. But there’s something very interesting happening at a vision level, and I’m more intrigued by how that’ll play out than whether Jon is good or bad, truly alive, or just an amazing simulation.